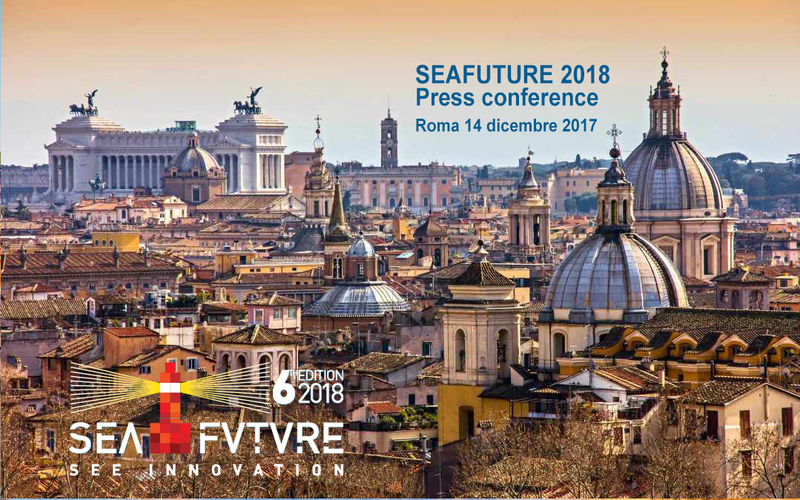 The sixth edition of Seafuture, which will take place at the La Spezia Naval Base from June 19th to 23rd, 2018, has been presented yesterday in a press conference held in Rome at the Circolo Sottoufficiali della Marina Militare. 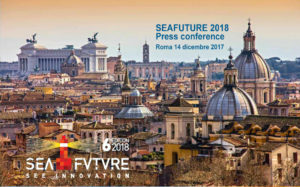 Seafuture is a unique event – supported by the Italian Navy – on Blue Growth, involving big companies, SMEs, maritime technology and industrial clusters. Oceans are our gate to the world, that is why safe seas and maritime security are basics assets of this event. The high degree of interest among international stakeholders is confirmed by the massive presence of Foreign Navies (26 in 2016), represented at the highest levels, which appreciate the opportunity to discover the most up-to-date technologies and solutions offered by “ Sistema Imprese Italia”, along with the possibility to make commercial agreements both with the Italian Navy and other participating companies. 50 PhD thesis that will compete for the Seafuture Awards, prizes for the most innovative master or doctorate theses on relevant subjects. International players such as Leonardo, MBDA, Fincantieri, and Elettronica already confirmed their participation. The requirement for both military and civilian supplies – with shorter delivery time and reduced costs – finds an interesting answer in Seafuture’s offer, which proposes an Italian business model enhancing experiences, skills and know-how of the Italian Navy shipyards, research centres, universities, and the Ligurian cluster of maritime technologies, along with the technological divisions of the Italian Navy, including CSSN, CISAM and CIMA. In providing support to Seafuture 2018, the Italian Navy intends to boost national companies and economy, in the wake of a long-lasting tradition characterized by deep integration across the various stakeholders of the military shipbuilding sector: big companies, SMEs and Italian Navy. The event will be mainly focused on new technologies, refitting and upgrading, and dual-use, which is the possibility to use Italian Navy assets both for military and civilian purposes. Seafuture is also an opportunity to promote Maritime Research and Technology Innovation. Various seminars and conferences will be organized on this theme, from environmental management in the shipbuilding sector, to water management, and ‘ship 4.0’. This 6th Edition will deal with Unmanned Autonomous Systems for underwater applications and environmental safety and control technologies, thanks to the support of Italian General Secretariat of Defence. Seafuture 2018 – See Future is organized by Distretto Ligure delle Tecnologie Marine, Consorzio Tecnomar Liguria, AIAD, EIEAD, Liguria Region, in cooperation with La Spezia EPS Special Agency Chamber of Commerce Riviere di Liguria, and promoted and supported by the Italian Navy.